(NewsUSA) - Many high school students who might not have seen college as an option are now ready to pursue advanced education as Dell Scholars, thanks to a unique nonprofit education program. The Dell Scholars Program was developed by the Michael & Susan Dell Foundation to assist high-school seniors who have overcome significant obstacles to obtain a college education. In 2018, of the 500 scholarships offered through the Dell Scholars Program, 281 were awarded to AVID students. Students in the AVID (Advancement Via Individual Determination) program work to overcome challenges, including limited funds for college and limited family experience with college and college preparation. 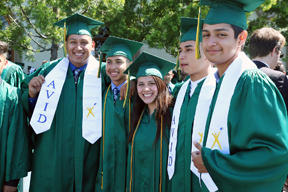 AVID is a nonprofit that provides training and support to educators, so they can ensure that all of their students are college-ready. AVID educators are trained to tutor as well as mentor students, and to provide opportunities for the students to develop friendships and support networks with peers. Many of the AVID participants are first-generation college students who benefit from the mentoring and social support as well as from the academic instruction. "The Dell Scholars are an inspiration to all of us at AVID. These students have overcome significant obstacles to succeed, and we're honored to be a part of their college journey," Dr. Sandy Husk, CEO of AVID, says in a statement announcing the scholars. "I'm excited to see what they will achieve in the Dell Scholars Program." All students who become Dell Scholars receive not only financial assistance to help defray the cost of college, but also resources and mentoring throughout their college experience. These supports reinforce their study habits and relationship-building skills from AVID and similar high school programs that will help them succeed and earn a bachelor's degree in the subject of their choice. According to the Dell Scholars website, "Our support is constant until they leave campus with a degree in hand." Dell and AVID share the common goal of leveling the playing field for promising high school students who might not otherwise have been empowered and motivated to prepare for and attend college. For more information about AVID, visit avid.org. For more details about the Dell Scholars Program, visit https://www.dellscholars.org.